Offering the world’s best power measurement accuracy, the WT3000E provides engineers with a solution for testing and verifying product efficiency. The WT3000E is ideal for the design and testing of Solar Inverters, Motor Drives, Lighting Systems, Uninterruptible Power Supplies, Transformer Testing, Aircraft Power Systems, and other power conversion devices. 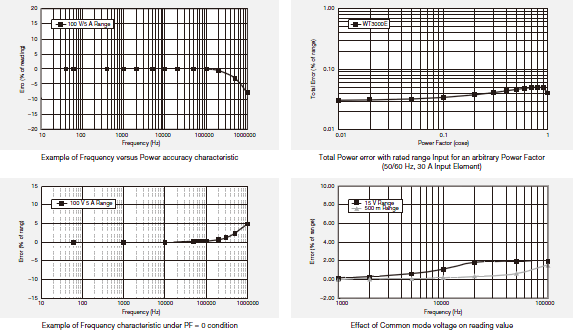 With basic power accuracy of ±0.01% reading, DC and 0.1 Hz-1 MHz measurement bandwidths, and up to four input elements, the WT3000E provides high-accuracy measurement of I/O efficiency. 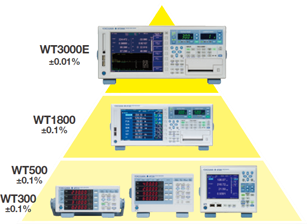 The WT3000E is a member of the WT series of power analyzers which are designed to meet a variety of user needs. 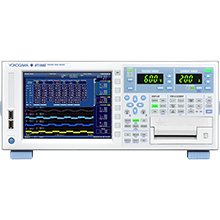 The WT3000E has the highest precision of all the Yokogawa power analyzers in the WT series. The WT300/WT500 series are high price-performance models popular for production line applications. The WT1800 allows measurement data to be viewed in a variety of ways, including numerical value display, waveform display, and trend display capabilities. 2A and 30A input elements can be installed together in a unit.